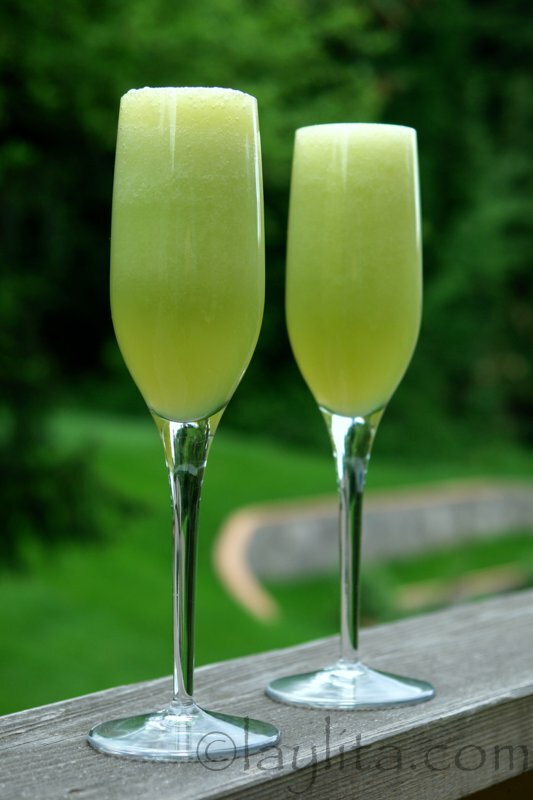 This honeydew melon bellini is a refreshing take on the classic drink, it is made with honeydew melon puree, lime juice, and sparkling wine. I originally saw this honeydew melon drink recipe in a Bon Appétit magazine several years ago. It was one of those where you think this would be such a great drink to make, but you never actually make it. Finally, I had a honeydew melon on hand and remembered the drink, but I couldn’t find the issue that had the recipe. 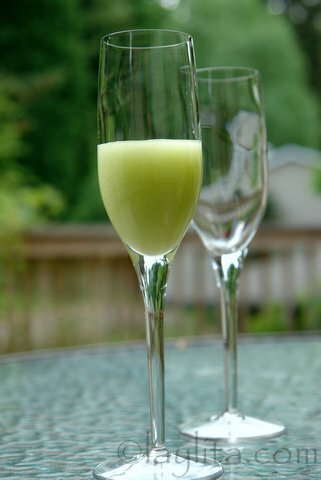 I did a search on Epicurious.com and nothing, maybe I have the exact name wrong, but I did remember that the recipe included puree from fresh honeydew melon and prosecco -or sparkling wine of some sorts. I love the traditional bellini, a sparkling peach cocktail, and have some good memories of after work happy hours drinking bellinis. 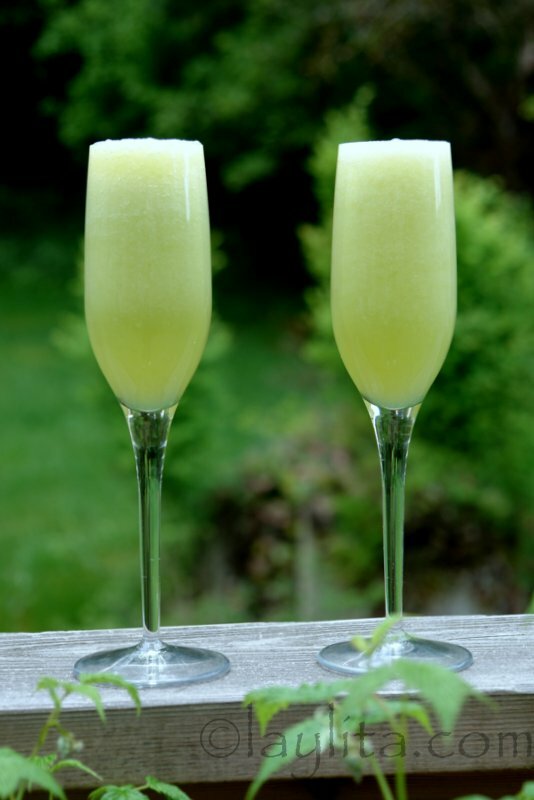 I am waiting for the local peaches to make their debut to make the classic drink, but this honeydew bellini is a great variation (though I’m sure the purists will say a bellini can only be made with peaches). 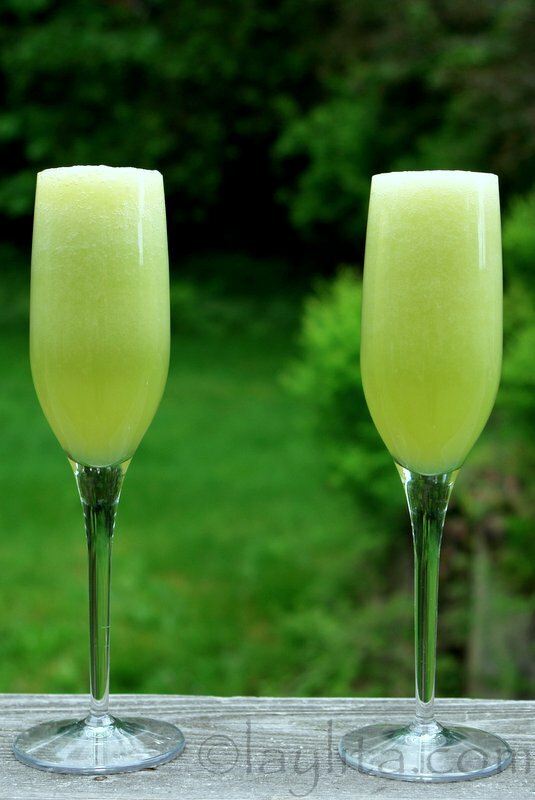 A refreshing take on the classic drink, this honeydew melon bellini is made with honeydew melon, lime juice, and sparkling wine. 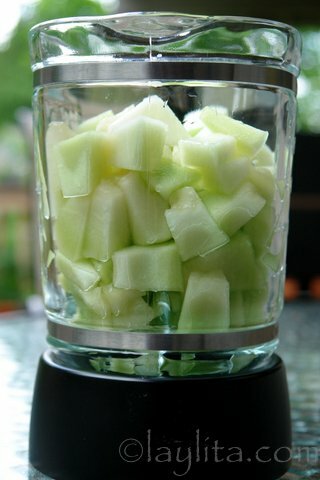 Combine the diced honeydew melon with the lime juice and sugar in a blender and blend until you obtain a smooth puree. Strain the puree, chill for at least 30 minutes or until ready to use. 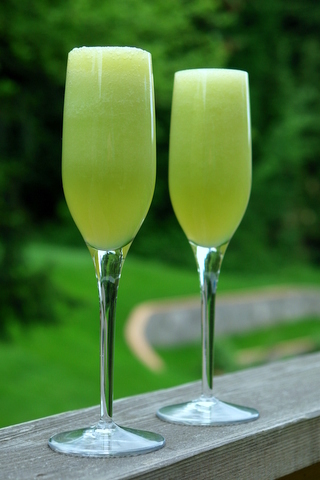 Pour the honeydew melon puree into champagne flutes, no more than half full. 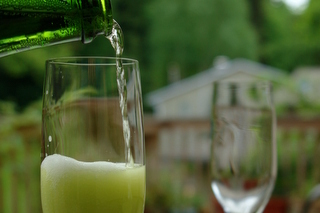 Add the prosecco or other sparkling wine, pouring it gently to avoid making a bubbly mess. For a non-alcoholic version you can replace the prosecco with sparkling cider, sparkling lemonade or even sparkling water for a lighter bubbly drink. 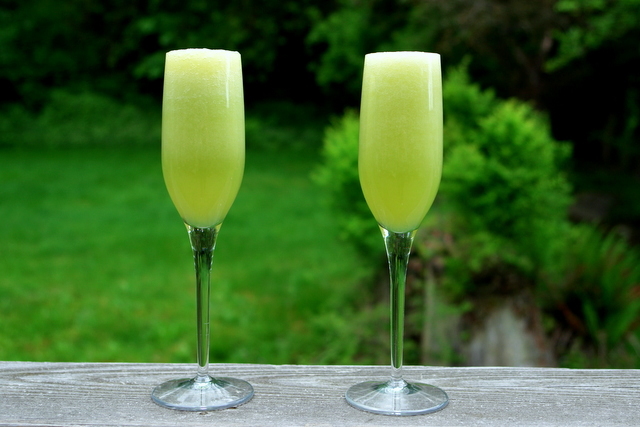 I made this honeydew melon bellini for a brunch party and it was a great success. It was refreshing, fruity and bubbly, a great combination. For a non-alcoholic version you can replace the prosecco with sparkling cider or other sparkling fruit juice. 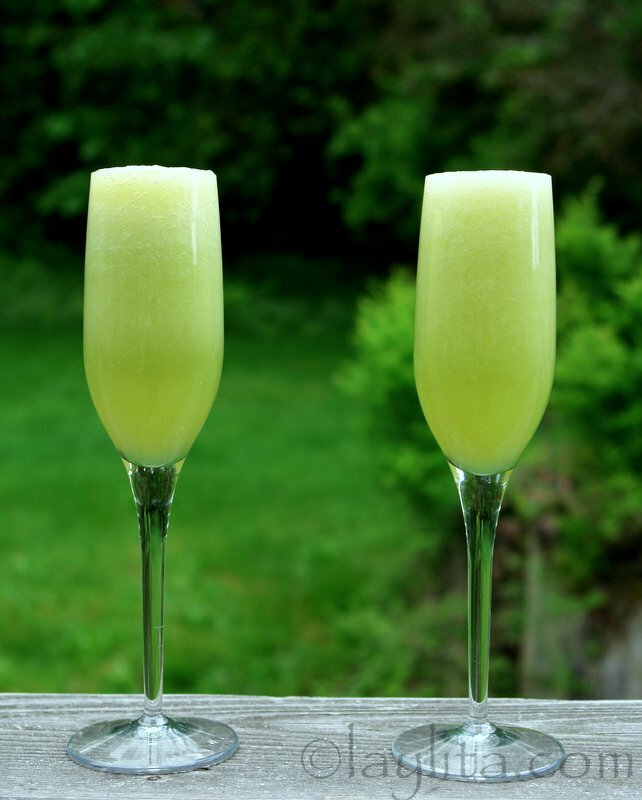 The only advice I have is to pour the pour the prosecco over the honeydew melon puree very carefully and slowly, it tends to get foamy and spill over a lot more than any other combination of fruit puree and sparkling wine. ooH, that looks really good. I must give that a try! I came across your site from I Cook4Fun>From Argentina With Love :) Thanks for sharing! What a fun Summer cocktail. 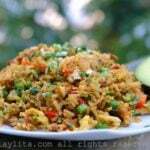 Hi Layla- I made your Carne en palito the other night. Thanks for your help, I did find the thin beef. My meat did not come out as red as yours, I could not find annatto powder so I tried to make my own by crushing the annatto seeds. That did not work so I made an achiote (the recipe was on the bottle of the seeds) which worked out great! But I am on a hunt for annatto powder. Blogged about your recipes today, it was a Standing Ovation! meal. Thanks for sharing! Oh BTW I had company the other night and served your limonada, one pitcher of lime and one of lemon and they went nuts for it. 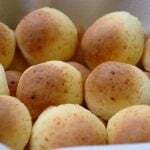 Hi RobinSue – I just checked out your carne en palito and it looks delicious, the achiote or annatto is mainly just to give it the color, it adds minimal flavor, I’m glad it worked for you! Making me thirsty :) the color is so beautiful! This looks so freshing and good. I love the color, too. What a great refreshing drink especially as I sit here in over 100 degree weather. Buenas tardes, acabo de probar este cocktel y esta verdaderamente delicioso, mis felicitaciones.